So, you sit in Woolies and tell your friend over a Cuppachino that you are worried about your son. You tell her that he was such a lovely, lively, normal little guy, inquisitive and energetic, talkative and intelligent… but recently you and your husband have notices that his behavior has changed. He tends to withdraw, doesn’t come for hugs and cuddles, seems to not look at people – even worse, he tends to astutely avoid eye contact when people address him, and most worrying of all is that his play has stagnated and become quite obsessive. He sits in a corner, peering at objects out of the corner of his eyes, endlessly amused by spinning objects, the wheels of his little cars, the rotating blades of a ceiling fan, the rotations of the clothes in the washing machine. He has lost words out of his vocabulary and he relies more and more on body language to communicate what he wants. He tends to pull you and your husband towards his favourite objects, demands things with tantrums and can’t seem to stop making high-pitched screeching sounds. He seems fascinated by the colour purple and whenever you take something away which he’s been staring at for hours, he throws a tantrum so large, that your neighbours must be thinking of reporting you to the Child Protection Unit. What you are describing, even though you might not know it, are the explicit symptoms of late-onset childhood autism. Your son might be one of a number of boys who is inflating the annual statistics of boys being lost to this strange, life-draining syndrome. “Boys?” you ask. “Yes, boys” – autism occurs much more frequently in boys than in girls – the ratio has been determined to be about 7 boys to every 3 girls, who are diagnosed with autistic spectrum disorder (ASD). I mentioned above that the condition is growing annually. In 1985 the number of children being diagnosed with autism was 1 in 15,000 live births. Then by the early 2000’s the figure suddenly was reported as 1 in 166 children becoming autistic. Just this past October, 2009, the Maternal & Child Health Bureau of Health Resources and Services Administration (HSSA), US Department of health and Human Services released a study which indicated that the number of children in the USA who currently had a diagnosis of ASD, showed that 1 in 91 children were now autistic (of which 1 in 57 were boys (The Prevalence of Parent-Reported Diagnosis of Autism Spectrum Disorder among Children in the United States, 2007, published in Pediatrics – reported by the Autism Research Institute, October 6th, 20009). This study surveyed 78,000 U.S. households and queried if their child, aged between 3 and 17 years “currently had autism or any other autism spectrum disorder”. Well, sad to say, it doesn’t come out in the wash and the proverbial sexist label, alluding to slower maturation in males, often drives children like your son, way past the opportune window of early intervention, which might have helped him come out of his autistic shell. I am a Clinical Metal Toxicologist and am often asked why I think that children become autistic. Before I share some thought I have on the matter with you, I wish to first state that the majority of children now affected by this syndrome, were born completely normal – they “disappear” around 9, 18, or 24 months, some as late as 36 months, when skills, formerly exhibited, or milestones achieved, suddenly start fading or regression sets in. There are, of course, some children who already appear “missing” or distant from birth – this rare, sub-group of boys and girls (mainly boys), has the diagnosis of what is called Kanners Autism. Those who start with a slow or sudden regression around 9 months or later, are diagnosed with late-onset autism. Regardless of the label – each condition is equally devastating. So, back to what I think the causative agents are for this dread condition: over the almost 20 years of my working with children with learning disabilities, I’ve spend the better part of 15 years studying children with autism. It truly wasn’t until the late 1990’s that I suddenly understood that these children are metabolically ill. Before then I bought into the lie that these kids are possibly psychologically ill or damaged (the Bruno Bettleheim theory of refrigeration mothers – The Empty Fortress). It’s as if a massive train-wreck has occurred in their metabolisms, derailing almost everything – they appear to be more allergic, more cranky; they are more picky eaters, get ill more often, have really bad digestive and gut issues, often can’t sleep, their pooh stinks to high-heavens and they either have shocking diarrhea (many, many nappies per day), or they are so constipated that one wonders how they will survive another day without a proper bowel movement! Once I understood that these children are ill, from a neuro-immuno-endocrinological point of view, I could take a step back and ask myself: “What has the capability to devastate and wreck an immune system and metabolism so aggressively that these little ones are living in a crazy soup of sickness and disturbed neuro-chemistry, driving them to distraction?” The answer was plain: toxins – yes, plain old-fashioned poisons! 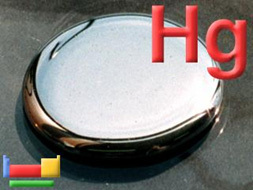 When a toxic metal comes into one’s body, it binds to sulfur and hydrogen in proteins. All enzymes and hormones are proteins. Hence, if toxic metals attach themselves to enzymes and hormones, the body starts shutting down, as metals disable these catalytic elements randomly or purposely, leaving devastation in their wake. The most likely poisons to enter our children are direct exposure-environmental toxins. You see, if you were a smoker in years before you fell pregnant, those toxins landed up in your blood stream, and eventually deposited themselves very neatly and tightly in your bones and bone marrow, where they powerfully displaced crucial minerals, like Calcium and Magnesium. When you are pregnant, the baby requires minerals and trace elements, which are, of course, provided through your diet as mother, but also liberated from your bones. If you were one of the “good” moms, who never smoked before or during pregnancy, but you grew up as a child in a household where your dad or mom or both smoked, you would fall in that critical category of people, who also have adipose fat, acute bone and bone marrow deposits of lead, arsenic, cadmium and other devastating metals found in cigarettes (over 4000 toxins in chemicals, which can act as rat poison), as you absorbed these as a passive smoker during your childhood! Now, let’s take the scenario one step further: Let’s say your parents never smoked, you never smoked, your partner (husband) never smoked, and you didn’t work in an office or employment situation where your work colleagues (inconsiderately) smoked around you (even during your pregnancy), you may just be that unfortunate someone who has had some amalgam fillings placed in your teeth at some time during your life. 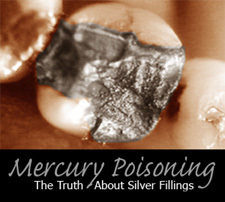 Mercury amalgams are 50% per weight of the composite of metals put into a filling called an amalgam, and regardless what dentists, who still place deadly mercury fillings in people’s teeth, tell you, the World Health Organisation, claims that a full 79% of all human exposure to mercury comes from mercury amalgam fillings (Smoking Teeth, www.IAOMT.org). 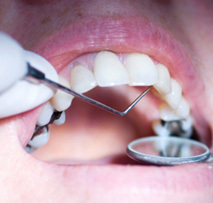 The anecdotal claims of safety by manufacturers and Dental Trade organizations are at variance with the published, peer-reviewed, scientific evidence to the contrary. The International Association for Oral Medicine and Toxicology, of which I am a member, states: “The precautionary principle requires action, once the possibility of harm exists”. 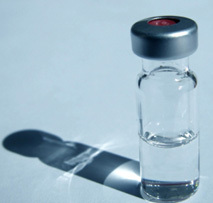 Then, to thicken the plot, there is the very real presence of mercury in all vaccines, except the Measles, Mumps, Rubella-vaccine, which became so controversial toward the end of the 1990’s, when Dr. Andrew Wakefield and co-authors published their concern about the role vaccines (not mercury) might play in the onset of lymphoid hyperplasia, a serious gut-condition which was diagnosed in many children with autism. The publication of their study in the prestigious Lancet Medical Journal (recently withdrew, after Dr. Wakefield was found guilty of being an unethical medical practitioner with a “callous disregard for the distress and pain suffered by these children” – http://www.telegraph.co.uk/health/7095145/GMC-brands-Dr-Andrew-Wakefield-dishonest-irresponsible-and-callous.html) caused more than just a storm in a tea-cup. It sparked world-wide controversy and panic and many hundreds of thousands of parents across the globe reneged on vaccinating their children – even the then Prime Minister of Britain, Tony Blair refused to say whether or not he and his wife had his son, Leo, receive the jab (MMR) or not. With vaccine rates plummeting after Dr. Wakefield’s article appeared in this prestigious journal, parent lobbying groups soon stepped up to the plate to say that their sons and daughters were not only harmed by the MMR, [although it appears that in a large number of cases children became ill very shortly after the administration of the MMR], but that they felt that any or all of the vaccines where to blame for the terribly increase in autism (in some cases a 273% increase in the rate of children diagnosed with autism occurred between 1987 and 1998 – a mere 11 years) in the state of California, USA. (www.naturalnews.com/011764.html), for example. Let’s start to get the story straight: do vaccines cause harm to infants or don’t they? Many well-funded, solid epidemiological studies world-wide have trashed the notion that vaccines are in any way causative. However, one needs to carefully read the small print and also see who funded the bulk of these studies. Pharmaceutical companies, who had the most to lose if thimerosal (49,7% ethylmercury) were to be banned from trillions of doses of vaccines, funded the larger proportion of these studies. Regardless of how flawed and how biased many of these studies were, there is this one, compelling truth that, regardless of Thimerosal (mercury as preservative) being removed from vaccines, autism rates are still soaring (http://www.blisstree.com/articles/thimerasol-exposure-declines-autism-rates-increase). It is therefore crystal clear, when one views the latest statistics that thimerosal is not the primary cause of autism. ‘the DDS data do not show any recent decrease in autism in California despite the exclusion of more than trace levels of thimerosal from nearly all childhood vaccines [emphasis Kristina Chew]’. The DDS data do not support the hypothesis that exposure to thimerosal during childhood is a primary cause of autism”. So, if it’s not cigarette smoke alone, or dental amalgams which spill deadly neuro-toxins into the tiny bodies of unborn fetuses, and if it’s not the mercury in vaccines, or the MMR with its live, attenuated viruses which are thrust into an immature immune system, at the beginning stages of an developing brain with un-forged dendritic connections, and it’s not the mercury in the fish, which pregnant mothers consume [pregnant mothers in Canada were already warned not to consume fish caught in Canadian waters during their pregnancy in 1976, as inland and coastal fish sources had been so contaminated by mercury! – www.jstor.org/stable/4312386;also seewww.doh.wa.gov/ehp/oehas/publications_pdf/whatcomadvisory.pdf, then what on earth is the reason why more and more children are becoming autistic at alarming rates, as if it is a run-away train, that has lost its brakes? I have one more plausible cause which I want to throw into the mix of worrisome facts, which might serve up our culprit. Is it this thief that comes one night and robs us of our children leaving behind only a phantom of who they once were –eyes staring blankly and bodies moving robotically, whilst the real life suddenly seems gone….? In 2008 I had the dubious privilege of being invited to tour Punjab and visit a Centre for Special Children in Punjab. I call the privilege dubious because the sights that assaulted my tender sensibilities have never stopped haunting me since that fateful visit. The extreme poverty, the dirt, the suffering of humans and animals and then the extreme suffering of the children…. Oh, the children! They were limp, paralyzed, spastic, some with large heads, bulging or squint eyes, startlingly stiff and others with contorted limbs, protruding tongues, mouths drooling, bodies jerking, small remnants of ones who once appeared to once have been human forms. Each one of these diseased children were being held by a traumatized, numbed, parent mostly just sitting with resignation and a dead, distant look in their eyes. That blank look soon turned to a beseeching and pleading stare, as I approached their broken child – the images of those children are forever etched into my mind. When I saw their ravaged bodies, I immediately knew that something was horribly wrong. There were literally hundreds of these children and I was told that daily more and more parents were reporting to the centre daily for help. The physical symptoms of these children told me they had been poisoned, but by what? A German Environmental Laboratory, Micro Trace Minerals volunteered to help me test the children for toxic metals. What we found through tissue sampling (hair) stunned us all: 87% of the children tested showed signs of elevated uranium in their systems. Allow me to briefly explain why this was such a chilling finding: Uranium is a radio-active metal. It decays into substances equally radio-active and deadly, Thorium, Radium (used for radiating tumors), Radon and Paladium. In addition to this, uranium is nephro-toxic (*meaning it destroys the kidneys*), and there isn’t a physiological system which isn’t altered when uranium is deposited into that system. As a radio-active metal uranium is highly carcinogenic. No wonder that a mere 40 kms from the Centres where these children found themselves, is an area called the Malwa	belt, which is said to have the highest cancer rates in the world. Radon, the deadly, odorless gas, which is 7,8 times heavier than normal air, is a daughter of uranium. It’s a deadly radioactive gas, which irradiates the lungs and causes a variety of lung diseases, including lethal lung cancer. The puzzling truth was that there are no uranium mines in the region of Punjab where these children and their families reside. In fact, Punjab is called the Bread-Basket of India and is a mainly agricultural state, not a mining hub. By what means then did they become so toxic? The answer lies in the coal-fired power plants which tower on the sky-line all over Punjab. Coal-fired power stations generate up to 10 times more radioactive waste than any government regulated nuclear reactor! 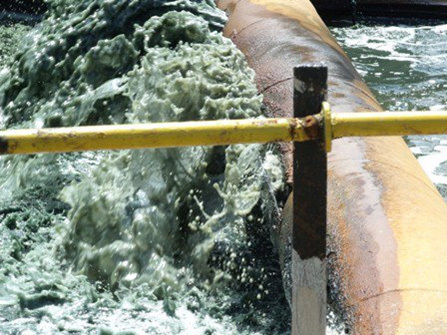 The fly-ash from the burnt coal is collected in fly-ash ponds (un-lined in India) and the highly toxic brew percolates down into the aquifer, poisoning all the pristine ground water and rendering it toxic, even deadly! Unborn babies are affected in the womb, because uranium is mutagenic. New-born babies are affected because uranium is neuro-toxic. Young children are affected because uranium and its daughters mess badly with one’s immune system, as well as one’s ability to produce red blood cells. The less red blood cells there are (i.e. the more anaemic one is) the less capacity the blood has to carry vital oxygen to the brain. Hence babies and young children’s fragile neurological wiring becomes compromised early in life, leading to seizures, mental retardation and overt brain injury. How on earth do I link this to autism?Coal-fired power stations and mines of any kind world-wide are the largest producer of both radioactive waste and of toxic metals, which are dispersed into the air and water sources, for human and animal consumption (i.e. if a cow drinks from a water source which is contaminated, it’s milk and meat will be radio-active and toxic) and for irrigation (i.e. if crops are watered with radio-active or toxic water, the vegetation and fruit becomes dangerous to consume). What does this mean within a South African context?South Africa’s largest energy production system relies squarely on coal-fired power stations. And our national Energy provider, the controversial and rogue utilities company, ESCOM, wishes to loan R4 Billion more from the World Bank to build more coal-fired power stations, Medupi and kkk, instead of setting up renewable energy projects, like wind farms, which don’t only yield dirty, non-renewable energy sources, but can produce up to 5 times more electricity at the same price. South Africa’s wealth in mineral resources has made it one of the radiologically dirtiest nations in world, because mining disturbs the earth crust and releases the radioactive elements. South Africa boasts the largest uranium deposits anywhere on the planet. It’s now largely defunct gold mines, currently spill up to 25 Mega Liters of acid mine drainage (radioactive and highly toxic waste water with a lethal pH of 2.6) per day into once pristine streams, lakes and rivers, which will soon affect more than just our irrigation of crops, it will destroy wild life, poison our livestock, contaminate all our aquatic life and make ever larger areas of our country radioactive hotspots. The sad legacy of these mines (albeit gold, platinum, uranium, iron, copper or zinc), is a pock-marked earth, impoverished communities and of the highest levels of radioactivity on the planet! In an area between Roodepoort, where I live and Krugersdorp on the West Rand is an informal settlement, called Tudor Shaft Informal Settlement. Within a stone’s throw of this settlement, in an open field, where locals walk daily, the levels of radioactivity have been measured and are between 10,000 to 100,000 Becquerels above background radiation limits. 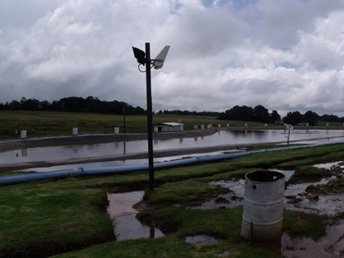 A once pristine spring fed a lake, called Robinson Lake in Randfontein, about 11 kms from my home as the crow flies. Today that lake is dead, with uranium levels of up to 40,000 times higher than what is considered safe! How did all this happen? Silently, greedily and insidiously mining houses raped the earth, never telling anyone who lived within 100 kms of their earth-shattering endeavours how toxic their explorations and operations are. I grew up in Germiston and Roodepoort and have lived in Roodepoort for most of my adult life. As a child I played on what was then known as “mine dumps”. Today I know better. 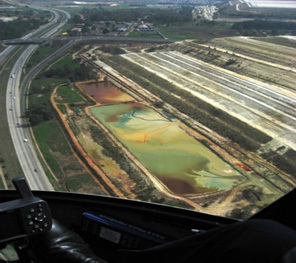 I never knew that the euphemistic term “mine dump” actually means “highly radioactive slimes dam” where radio-active sludge is pumped into, laced with the most toxic of elements on earth, and that all water, air and soil within hundreds of kilometers of such “dumps” become contaminated over a life-time with the particulate matter which makes it way into the air or water ways. I can almost hear the skeptics say: “But you are in your 50’s and not autistic – how does this all link to autism?” The answer is actually quite simple: I might not have autism, but my father contracted throat cancer when I was only 3. My mother had uterine cancer in her early 60’s and died of motor-neuron disease (a disease very clearly linked metal toxicity), I contracted breast cancer 2.5 years ago. Do metals cause autism? I have no doubt they do. Do all children become autistic? No, if I understand the words of Dr. Devra Davis, professor in preventative medicine at Mount Sinai Medical Centre in New York correctly, she said: “Genes give us a loaded gun, but environment pulls the trigger”. What kind of disease, syndrome or disability you might contract, might well be determined by an intricate sequence of genes handed down to each one of us individually, even within the same family, but the fulfillment of that genetic prophecy comes sooner rather than later for each one of us, who lives within this crazy, increasingly toxic world – and the clock is ticking. It’s true, at this present time that no-one knows for sure what causes autism, but it is clear that when one takes 3 live viruses and one injects them into a new-born, you have a smoking gun and the vaccines should be considered unsafe, until proven otherwise. The same holds true for mercury in fillings or thimerosal in vaccines, or exposure to mercury in fish, or lead, arsenic and cadmium in cigarettes – these are all lethal substances and one wonders what the wisdom is in compounding the toxic load in the very young and the very fragile, if for some the genetic code will crack sooner rather than later? Finally, the issue of living in an environment where one’s unborn child is the at-risk recipient of unimaginably dangerous radio-activity, mines, government and society should be brought to book for a world which is becoming more and more toxic. Dr. Alan M Goldberg, professor of toxicology at the Bloomberg School of Public Health at Johns Hopkins University (http://www.care2.com/greenliving/do-toxins-cause-autism.html?&page=2), clearly named the three canaries in the coal-mine – “Breast cancer, prostate cancer and autism are three examples (of diseases with unknown causes that are increasing in the population), he stated.